I have learned about many cultural heritage sites throughout my time as a Virtual Student Federal Service Intern with the Smithsonian Cultural Rescue Initiative, the physically largest of which is the Cliff of Bandiagara. A UNESCO world heritage site encompassing 4000 square kilometers in the Mopti region of Mali, this “Land of the Dogons” overlooks and is surrounded by 289 primarily Dogon villages. 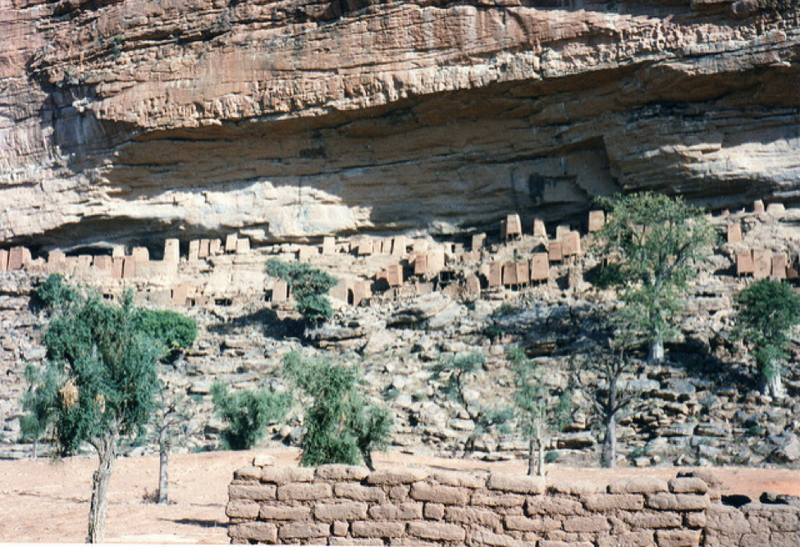 The cliff-face houses graves, sacred spaces, and the remains of the civilization who inhabited the cliffs before the Dogon arrived to the area in the 14th century. One of my assignments as an intern was to search the Factiva database for any reference of attacks at or damage to cultural heritage sites in Mali between 1999 and 2002. The search returned no report of deadly attacks during this time, but did include vague references to the ever-present looting of this remarkable site. Local Dogon tribesmen “risk their lives dangling from the escarpment to plunder objects left behind in the graves,”and sell to western tourists looking for a souvenir of their trip. This sort of attack on cultural heritage is not as dramatic as the increasingly frequent armed assault on or at historical sites (for which Mali would unfortunately become famous in 2012), but looting and exploitative trade is both more common and more geographically widespread – and is not restricted to periods of conflict. Looting attacks not only the site, but knowledge itself. This internship, and this assignment in particular, has reminded me why the work of the Conflict Culture Research Network is so vital, why we need to protect our cultural heritage (globally speaking), and how limited each of our own spheres of information can be. Smith, Alex Duval. “Mali Plunders Its Desert Heritage to Feed Demand for `Primitive’ Art.” The Independent, 17 Mar. 2001. Velton, Ross. “Show a Little Respect – Travel – Mali – Responsible Tourism – Think before You Go.” The Times, 23 Oct. 1999.